The Basic Lesson is about getting to know the boat, some of Celtic Song’s sailing community, the goals of our sailing project and an understanding of the commitment you’re making for the adventures that lie ahead. Raising the mainsail: Keep a good distance from lee shore; open all “red tape” clutches (reefing lines and vang), make sure all reefing lines are able to run free, head into irons, take off sail ties front to back, when everyone is in the cockpit, release and ease the main sheet. Using the electric halyard winch: Make sure all lines are clear of the halyard. 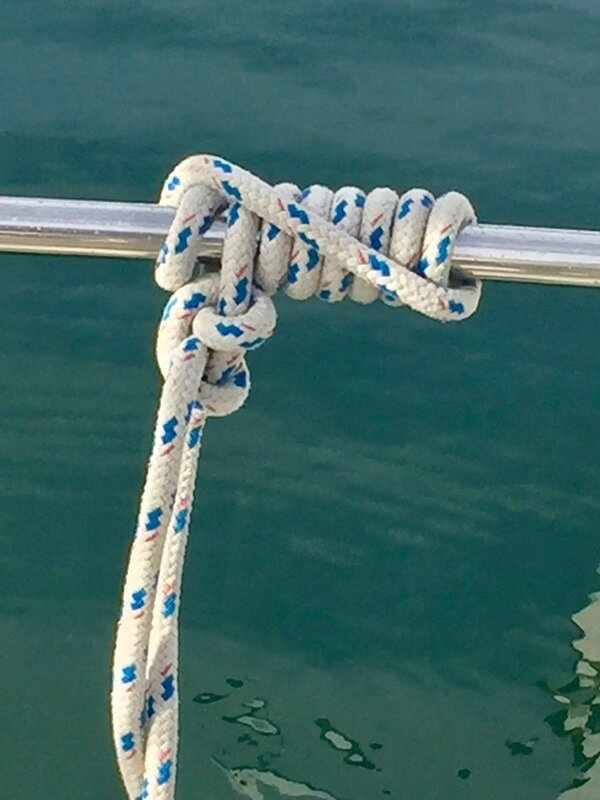 Slowly raise the main halyard, watching and listening for any obstruction of lines or sail, pause occasionally. When the sail is one foot from the top, insert winch handle in halyard winch and complete process. Lowering the main: Hoist the lazy jacks, head into the wind and release the halyard. Flake the sail by pulling aft on the leach. Tie off with slippery hitches. 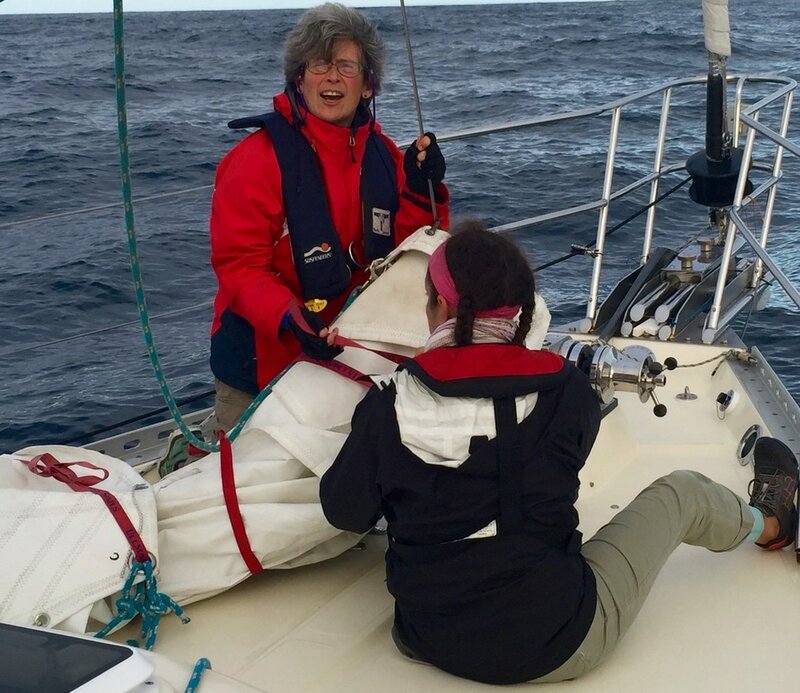 Unfurling the genoa: Position the vessel off the wind, make sure the furling line is ready to run free. Always keep tension on the furling line as it unfurls. Furling the genoa: Position the vessel downwind on a broad reach, ease the mainsheet, and begin pulling the furling line in as the jib sheet is eased. Though you may have done most or all of these things on another boat, you won’t be familiar with Celtic Song or the way our crew has been trained to do things. Nor will you likely be able to grasp all these procedures during the Basic Lesson. It’s just a good opportunity for you to meet us and for us to meet you. Knowledge and skills are important assets, but so are a willingness to learn and the collaboration necessary to be part of happy and functioning crew. You should know by the end of the day whether you’re ready to sign up for the other four lessons listed in this section. _____ Weather: Wind speed & direction, wave height and intervals, weather forecast, any alerts? _____ Get a fix on master chart plotter. (Press FIND SHIP for current lat and long). _____ Flares – current? How many? _____ Safety flare light – operational?